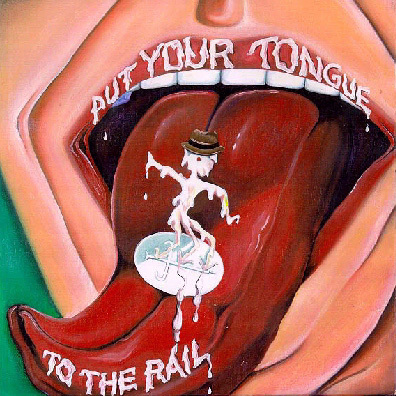 Put Your Tongue to the Rail is a two-cd tribute to the Jim Carroll Band featuring more than two dozen artists from Philadelphia. Stylistically it touches on punk, post punk funk, traditional american guitar rock, garage/psychedelia, singer/songwriter stylings, eastern european folk music, stadium rock, homocore-cabaret, country, and free jazz. The project began as a multi-band "tribute" concert in Philadelphia in September of 1996, organized by Mike Villers. The concert generated so much excitement, Mike decided to do an album that would showcase local talent while also demonstrating the power of the Jim Carroll Band's songs. He rounded up the best bands in Philly and embarked upon what became a three -year project and a two-CD set that includes covers of almost all of the Jim Carroll Band's songs! Jim Carroll Band bassist Stevie Linsley even came onboard at the end to master the album with Mike. Genus Records: album details, audio clips, etc. Review: a full-length review of the album. Interview with Mike Villers, the man responsible for this album!